The holidays are the best time of year to spend with friends, family, and pie. 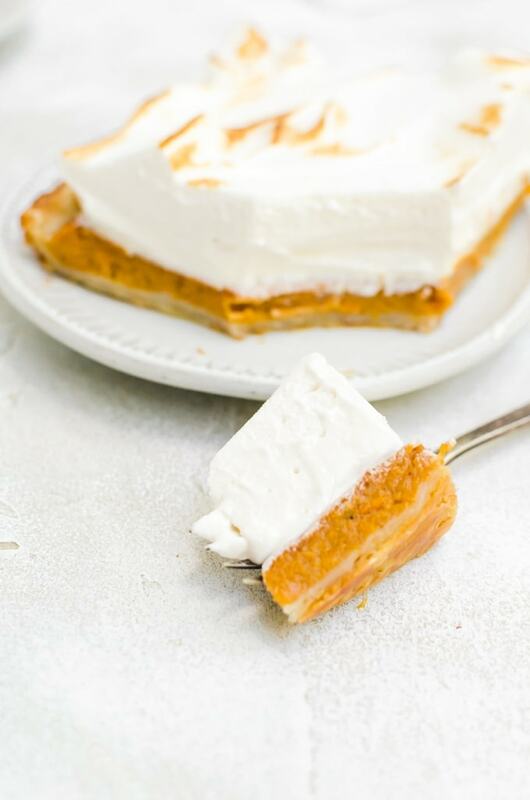 Everyone will love gathering around and enjoying a slice of this maple sweet potato pie. 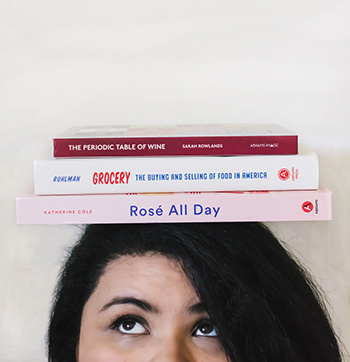 Thank you Karo® Corn Syrup for sponsoring this post. It’s no secret that autumn is my favorite time of the year. I love everything about it. From the vibrant shades of orange, yellow, and red everywhere you look to the light rain and cozy sweaters; it’s all amazing. We may occasionally miss out on summer berry picking at the farm, but we never miss the chance to go apple and pumpkin picking with hayrides, warm apple cider, and doughnuts. We carve pumpkins and decorate every inch of the house in autumnal decor. Then there’s the pie. We love pie in this house. I, personally, am a fan of all pie. When I was a child, I remember visiting my great-grandmother and spending the day baking sweet potato pies with her. I’d help to roll out the dough, but of course, I’d always play with the dough and getting dirty with my sticky hands. She’d bake it up anyway and it’d be my own special pie. Dirty pie, that’s what I everyone said I called it. Those were some of my favorite memories of my great-grandmother and I miss her dearly this time of year. I wish I found my love of baking while she was still alive so I could absorb all her knowledge and recipes. It’s one of many regrets I have. 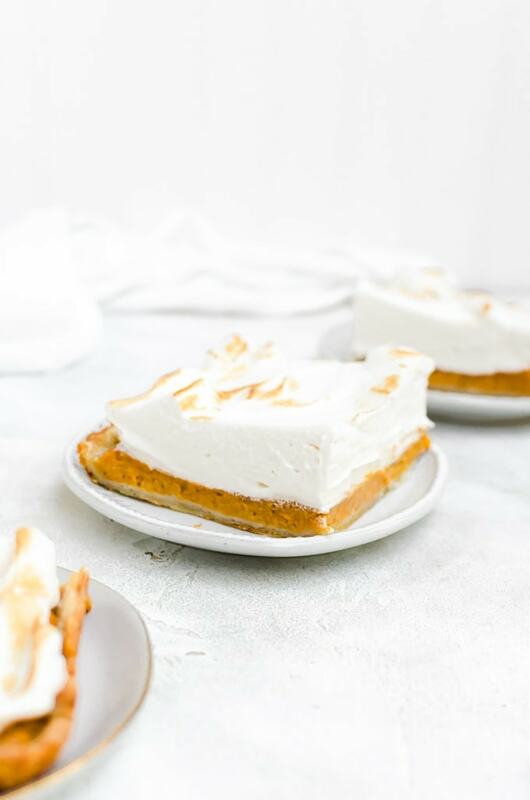 I made this maple sweet potato pie using some memories I have about what we did together, flashes of memory I have stored deep in my mind, and adding some of my modern-day know-how. I know for sure my great-grandmother used heavy cream in her sweet potato pies. She also used Karo® Corn Syrup. 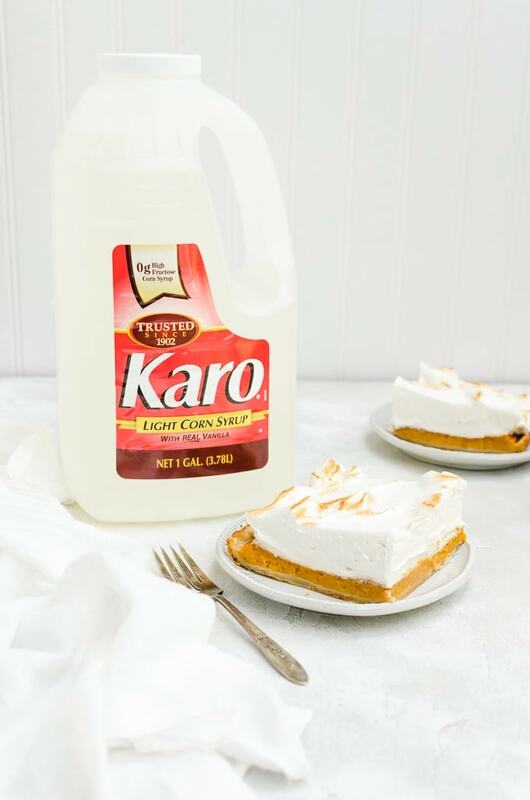 The Karo syrup helped with the end texture of the sweet potato pie, and added consistent sweetness without overwhelming the pie with other flavors. If I used just maple syrup in this pie, it would end up tasting only like maple. 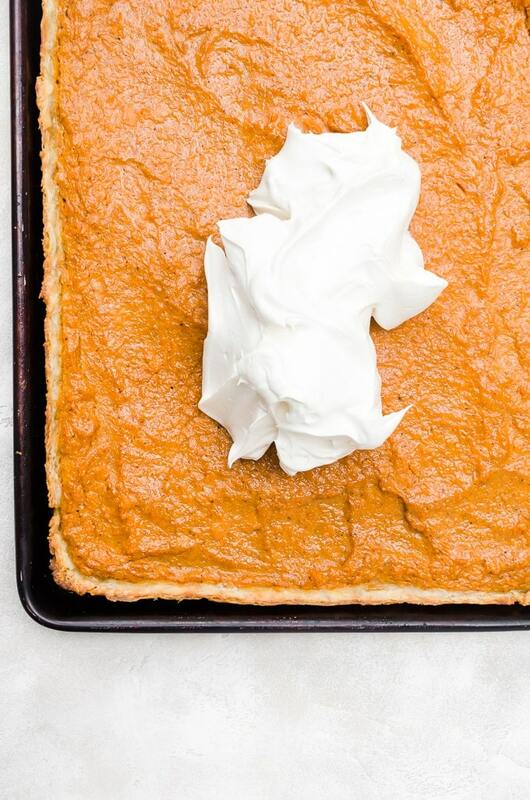 While the thought of a maple pie is amazing, I want this to be a maple sweet potato pie. And if my great-grandmother and chefs all use Karo for its quality and consistent performance, then it’s good enough for us, too. 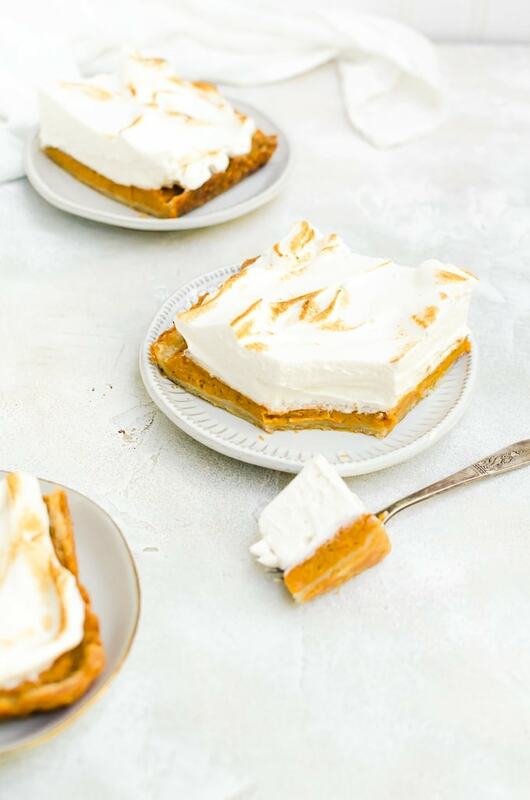 This maple sweet potato pie is meant to feed a crowd, so I made it into a slab pie. 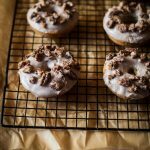 The meringue on top is a showstopping finish that has a lovely light maple caramel flavor. 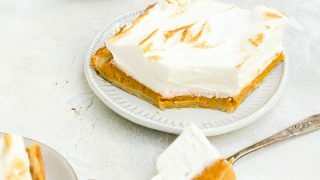 You can make the pie the day before, and then quickly whip up the meringue and top when you are ready to serve! Make the crust. Mix together the flour, sugar, and salt together in a bowl or food processor. Cut in the butter using a pastry cutter or food processor until the mixture resembles large crumbs the size of lentils. Add in the water, mixing in slowly, just enough so that the mixture sticks when pressed together. You may not need to use all the water. Turn the dough onto a plastic wrap and form into a large rectangle and wrap tightly. Chill in the refrigerator for at least an hour. Make the filling. While the dough is chilling, cook and mash your sweet potatoes until smooth. Allow to cool. Mix together all the ingredients into the sweet potato and mix until smooth. Sprinkle flour on a large flat surface and place the dough down. 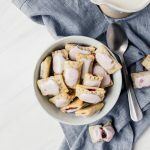 Roll out until it is a large rectangle big enough to fit in a rimmed baking sheet. Transfer the dough into a rimmed baking sheet and trim the edges so they are flush with the top of the rim. Once the oven is preheated, pour the filling into the dough and bake for about 35 - 40 minutes,or until the edges of the pie are set, but the middle is still slightly jiggly. It will set more over time. Set aside to cool. Make the Meringue. Place the egg whites in a freshly cleaned and thoroughly dried mixing bowl. Add the sugar, maple syrup, Karo, and water into a small, thick-bottomed saucepan. Heat the sugar mixture and do not stir. Brush the edges of the pan with a wet pastry brush if you see sugar crystals forming. Boil the mixture for about 3 - 4 minutes. While the mixture is boiling, beat the egg whites until medium peaks form. Once the eggs reach medium peaks, turn the heat off the sugar mixture and turn down the speed on your egg whites to medium. Gently begin to pour the sugar mixture between the bowl and the beaters and continue to beat until the mixture becomes stiff and glossy. 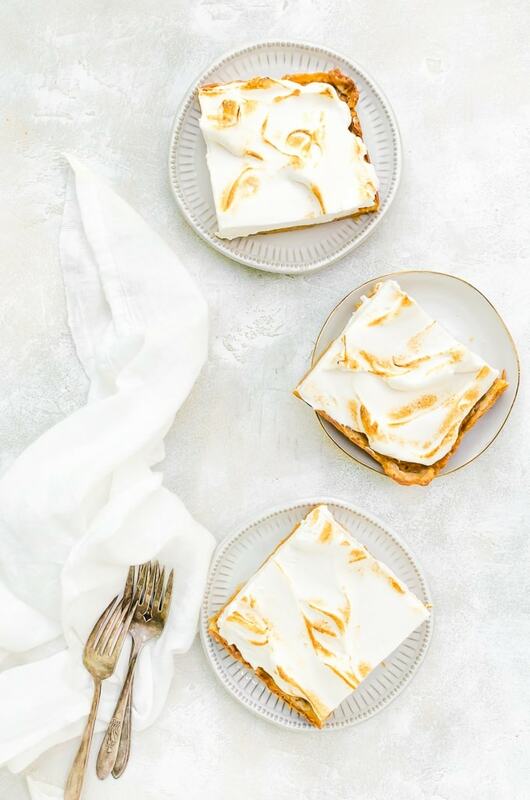 Swirl the meringue over the pie and then torch with a kitchen torch or a broiler. That story with the dirty pie is so sweet. I bet your great-grandma is looking down on your so proud. BTW – sweet potato is my favorite kind of pie. I’ll have to try this recipe!